About the Watts 1 LF25AUBZ3 Valve, 1" Pressure Reducing NPT Threaded Female Union Inlet x NPT Female Outlet Lead Free A brand of Watts Water Technologies, Watts Regulator Company is an innovative manufacturer of water quality products for your plumbing needs. The 1 inch 1 LF25AUBZ3 (Part # 0009309) Series Water Pressure Reducing Valve is used in commercial and residential applications to reduce incoming water pressure to a sensible level for protection of plumbing system components and to reduce water consumption. This series is suitable for water supply pressures up to 300psi (21 bar) and may be adjusted from 25 to 75psi (172 to 517 kPa). The standard setting is 50psi (345 kPa). All parts are quickly and easily serviceable without removing the valve from the line. The standard bypass feature permits the flow of water back through the valve into the main when pressures, due to thermal expansion on the outlet side of the valve, exceed the pressure in the main supply. 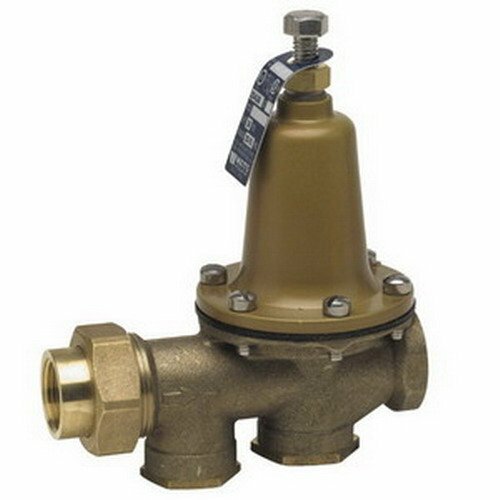 It consists of a bronze body construction, union inlet connection, integral stainless steel strainer and high temperature resistant reinforced diaphragm for hot water. Available with NPT threaded female union inlet x NPT female outlet. It has an adjustable pressure range and is serviceable inline. Maximum Working Pressure: 300psi (21 bar), Adjustable Reduced Pressure Range: 25 to 75psi (172 to 517 kPa), Standard Pressure Setting: 50psi (344kPa).